Located within an easy stroll of the historic riverfront, restaurants, art galleries, and shopping, the Raney Guest Cottage is available year round from an overnight getaway to a fortnight stay. Towels and linens are furnished. Frequently referred to as Florida’s Forgotten Coast, Apalachicola and its historic structures take one back to a time when cotton was king, the seaport was one of the busiest in the Union, and travel depended primarily upon waterways. Fondly called “Apalach” by locals , this place is the stuff of which Gloria Jahoda wrote when she penned “The Other Florida”. REGRETTABLY, PETS CANNOT BE ACCOMMODATED. 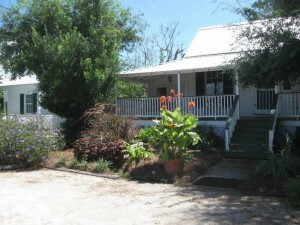 Please contact the Apalachicola Bay Area Chamber of Commerce (850- 653-9419) for pet-friendly vacation rentals. Central heat and air-conditioning, two bedrooms, two full baths, dining room, fully-equipped kitchen, two gas fireplaces, screened back porch, TV, VCR, washer/dryer. Towels and linens furnished. 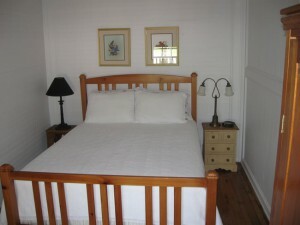 The rental rate is $175.00 per night which DOES NOT INCLUDE STATE & LOCAL TAXES. Tax rates in effect at time of booking can be ascertained by contacting the cottage manager at 850-653-7196 or requesting that information when sending an inquiry through TripAdvisor or FlipKey. The seventh night of weekly rentals is complimentary. Click here to view more information and see availability.